Quentin Tarantino is an Elvis man, no doubt about it. Just like the leading man in his smash hit Pulp Fiction. On the new 10th Anniversary 2-Disc Collector’s Edition he introduces some deleted scenes including one in which Mia (Uma Thurman) gives a long schpiel about how there are only two types of people; those who like The Beatles and those who like Elvis. Nobody, she says as she scrutinises Vincent (John Travolta) through her High 8 camcorder, can like both equally. Although this scene hit the cutting room floor, the sentiment in it pervades the film. In the very next scene, the pair hit the dance floor at ‘Fat Rabbit Slim’s’, a slick ’50s retro rock ‘n roll joint, and, barefoot, perform what has to be the coolest twist ever captured on celluloid; Mia shakin’ her sharp black bob and Vincent with his long greasy locks pulled back in a pony tail. Never mind the fact that she’s all wired up on cocaine and he’s totally zoned out on smack; the following scene dispels any glorification of drug life. In one of the most memorable and shocking moments in the entire film (and there are many fine ones), an overdosed, salivating Mia is brought back from the brink by a shot of adrenaline administered directly to her heart. 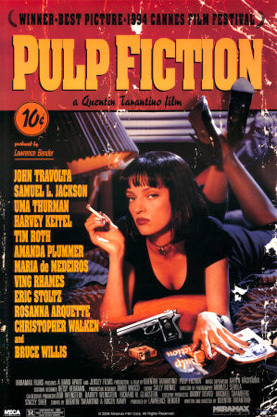 Pulp Fiction is a compilation of three stories; one about this near death date between the mobster’s wife and his minion; one about a boxer named Butch (Bruce Willis) on the run from the mobster (Ving Rhames); and one about the disposal of a body accidentally blasted to smithereens all over the interior of Vince and his buddy Jules’s (Samuel L. Jackson) car. This last episode features Tarantino himself as Jimmy, an unsuspecting friend forced into dealing with the fleshy mess and the man called in to sort it all out, The Wolf (Harvey Kietel). In an extras interview, Uma Thurman describes the film as a “classic American pop medley”, concocted by Tarantino into a big fat juicy burger and craftily re-delivered to its audience, just like the ones at Fat Rabbit Slims, bloody as hell. It scored seven Oscar nominations, winning just one, Best Original Screenplay, for Tarantino and his co-writer Roger Avery. The journey begins with the American Heritage Dictionary definition of ‘pulp’ and by the end, you’re drenched in Tarantino’s version of it, the definitive cinematic form of the genre.